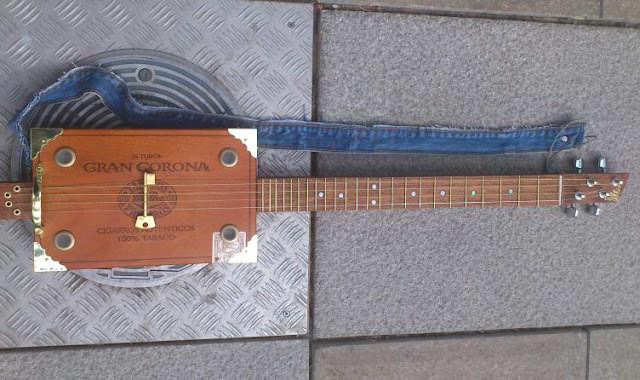 Made for myself, as I really wanted a tenor resonator. Designed around Stanley Mouse's 'Skull and Roses' poster...The guitar I would have loved to have played in the parking lots at Grateful Dead shows back in the 80s !! Made to order today. 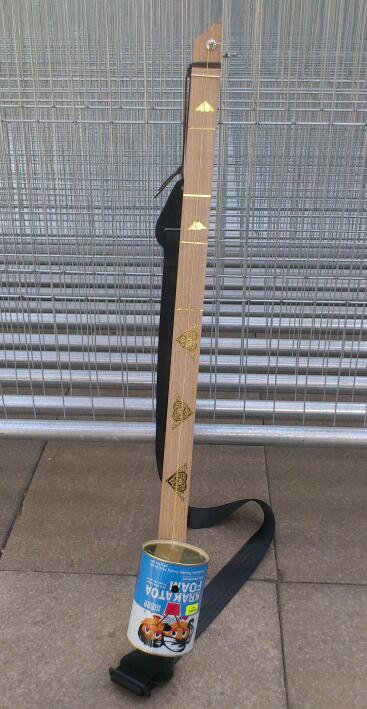 A lovely electro-acoustic ukulele, with a distinctive headstock. FYI, the tuners for the outer strings wind inwardly, and the inner two strings wind outwardly...Is that clear? Probably not...!! ha ha ! Huge thanks to all the lovely people who bought instruments this week. - If you bought them for friends, please pass on my website address / facebook address to them. 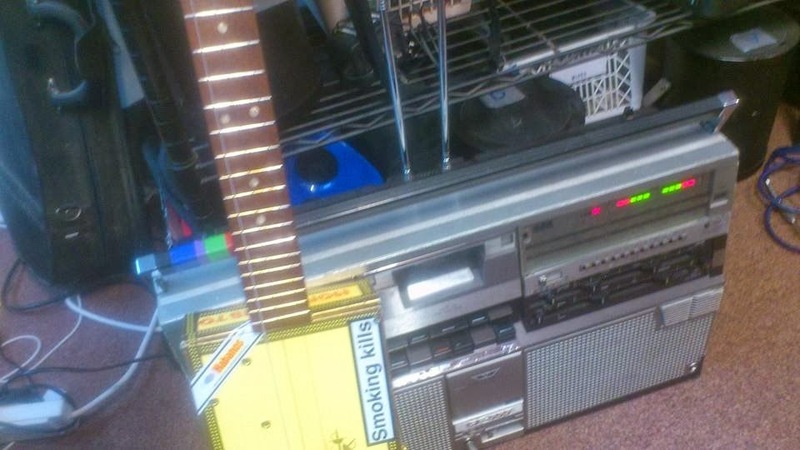 I will repair anything that needs done... (Not strings though ha ha !) - messages for me can be left at either. The action (height of the strings) can be altered by filing the grooves on the bridge or nut, or by placing something under the key... I like the action high...you may not... lowering the action too much may create buzz / dead frets. This can be fixed. If a fret is producing a buzz, an out of tune note, or you get the same note at two adjacent frets, then try tapping the fret down with a blunt object !! Nothing is glued, so frets may move, and the eyelets holding the strings at the tail piece may come off when you change strings... Tap them back in, or call me... fret / eyelet replacement free of charge ! The pick-up inside the box may become detached from the body. stick it back on with tape or blu-tac. Two wires inside may need re-soldered. Guides for DIY on the website. Search the archives! 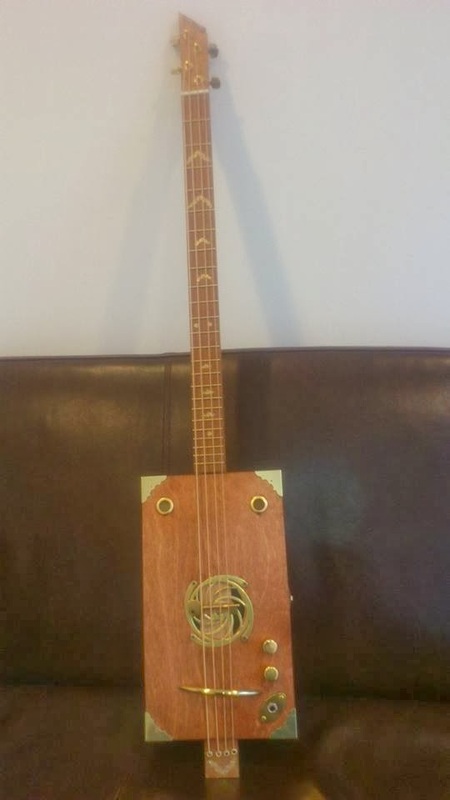 FOR SALE - Electro-acoustic ukulele. Cohiba cigar box, oak neck, mahogany fingerboard, brass frets and fittings, bead markers, piezo pick-up, 1/4 inch mono chassis socket. - SOUNDS EXCELLENT ! 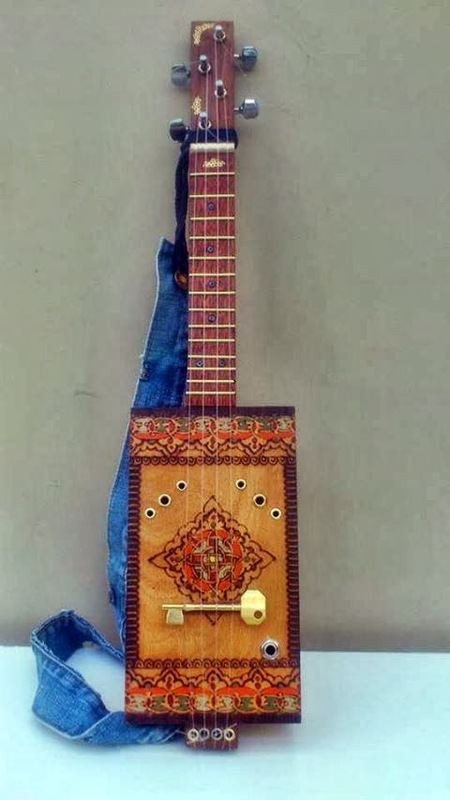 Looking and sounding lovely (I reckon), tuned GDAE, Gimanez box, from the phillipines, oak neck, mahogany fingerboard, brass frets and fittings, piezo pick-up, bead dots. - Send a message if you'd like it. I work in WASPS studios, in The Briggait, and when I finish work, I often go next door to The Clutha. 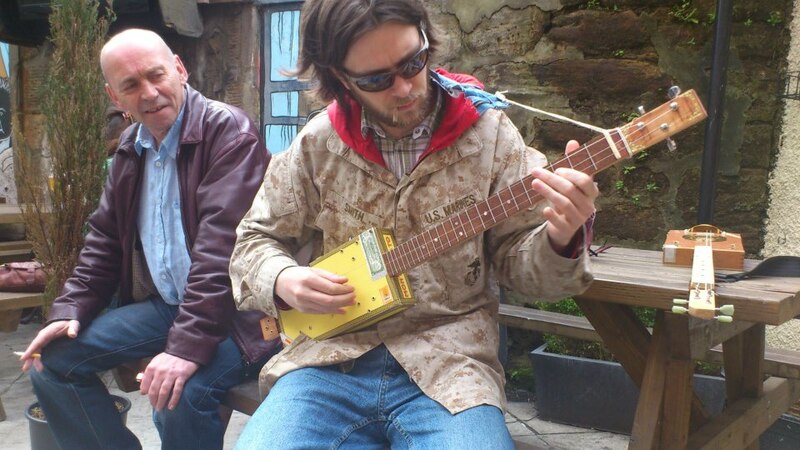 When I finish an instrument, I like to go and sit in the beer garden and try it out, through a wee amp. I've even played some of my creations through the P.A. in the bar, (as you'll see on this blog) - It's a great place, The bar staff are all friendly and have a blether, The customers are all there for the atmosphere, the great jukebox, the live music, the warm fire in the winter and a welcome unlike many pubs in Glasgow (No football team allegiances, no pretentiousness, no gangs of youngsters out to get trashed, no sexist drunks) a safe, friendly place. So for me, the events of Friday, November 29th 2013 are all the more upsetting. 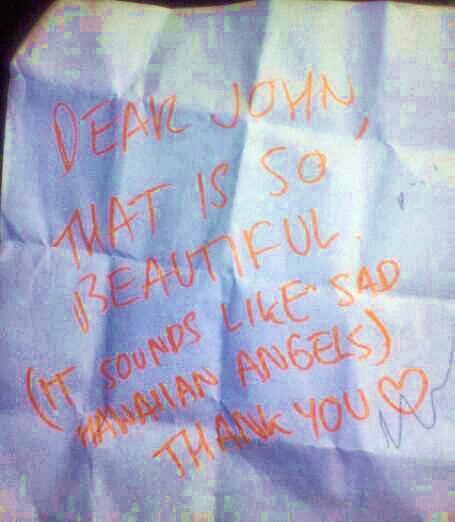 - At 10:25pm, when the bar was packed with people enjoying a weekend drink, and the ska band, Esparanza, a police helicopter hit the roof of the Clutha, killing the 3 crew, and 6 people in the bar...with many others injured. Incredibly there was no explosion or fire, and even more incredibly (according to the media at least), people passing by rushed to help. - It is now Wednesday, and the scale of the tragedy is starting to sink in. People who I know are dead, Others are still in hospital, The shock and sadness has spread around the world. Such a random, awful, sad and unthinkable thing to happen. It's hard to talk about. 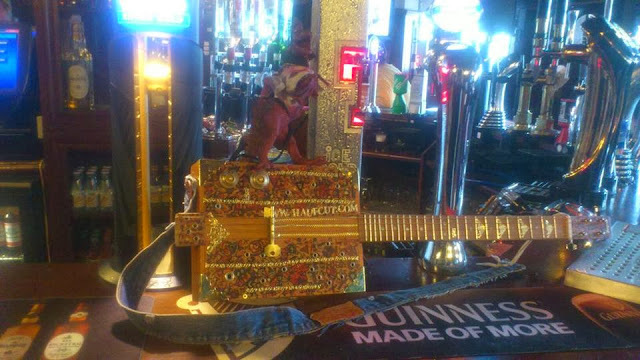 They can rebuild The Clutha, but it will be impossible to rebuild what it was. - A happy place. Here's a photo of a quick build. 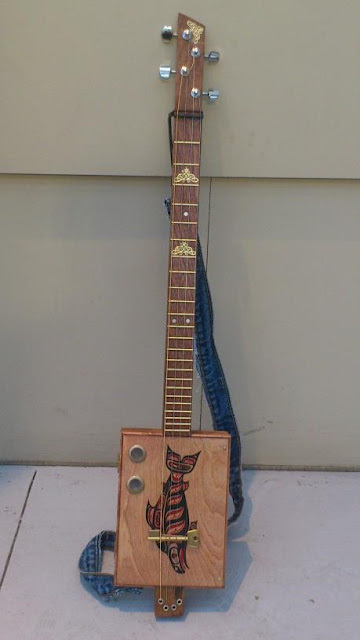 It;s an electro-acoustic ukulele, made for Becky Robb. Clamped and glued...with improvised counterweight ! Haufcut CBGs look good in pictures. There are lots of ways you can make your guitar sound the way you want it. Effects pedals can let you control volume, tone, distortion, reverb, echo...and lots more. AND YOU CAN MAKE YOUR OWN ! Have a go, and let me know how you get on. Cheers. 'Sweat Loaf' on the electro-acoustic CANJO - With mrjonthemuppet. This seemed like a good idea at the time ! and we made it to TV in the U.S.A. !!! Going to a festival? Take a haufcut ! Home now, and editing videos, so for a quick break, I pointed the laptop at the electro-acoustic dulcimer. 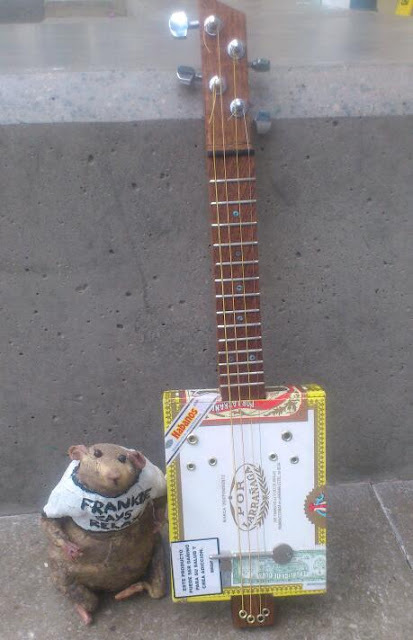 If you like this, and want it, or any other instrument you see here, send me a message on facebook. CHEERS ! The two 'Peek Freans', West Highland, Shortbread Tin Canjos Together. STOMP BOXES. (An electric bass/ kick drum). 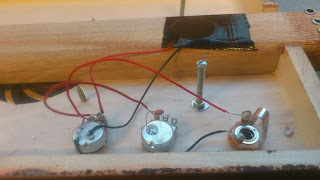 2 potentiometers (pots) - One Volume, One Tone. Take the biscuit tin lid and snip at the corners so it folds flat. Cut a metal section from the lid, fold it over the corner of your box and screw it in place, leaving one edge unscrewed, to allow it to slap against the box when stomped. File, chisel or sand down the area where the pots and jack will go. Drill 3 holes and secure the components with their supplied nuts and washers, tighten with pliers. Solder the wires to the components. Sorry that my sketch is rough. I hadn't intended for it to be online. Search the internet for a better one if you can! Fit the knobs to the pots on the outside of the box. 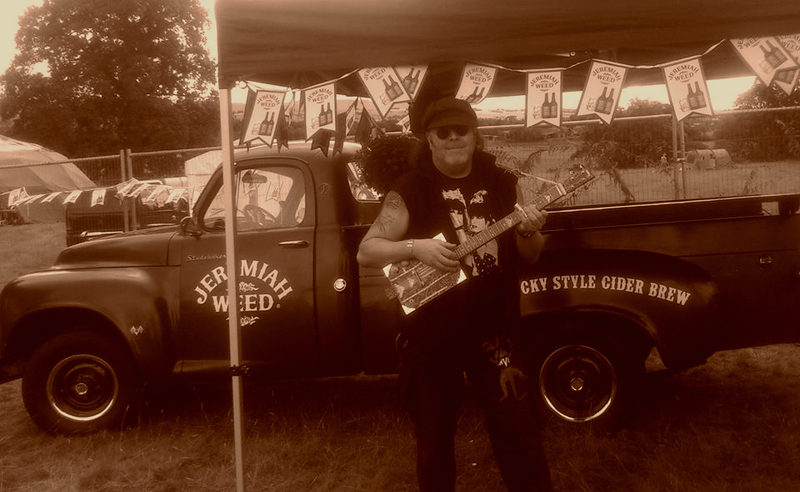 Honoured to join Glasgow music legends, Colonel Mustard & The Dijon 5, on resonator CBG, as mrdijonthehat of the Dijon 5 Demolition Band, to play 'Ginger Girl'...at the Red Road Flats, Springburn, Glasgow...Don't try and look for it, it's not there now ! Here's the video: Edited by 21st century haufcut! Colin 'Kozmik' Irons tries out the electro-acoustic, 4 string, 'Gran Corona' CBG unplugged. 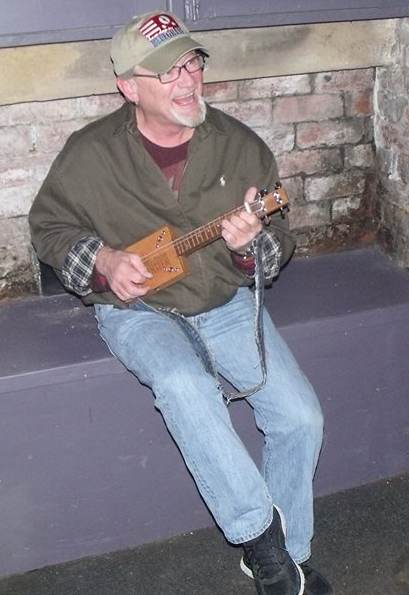 The first time he'd tried the CBG, and the GDgB tuning...and he's left handed! Star player! Video - With Construction photos. A single string, Cremola Foam Tin, Electric Diddley Bow. Piezo transducer pick-up, mono jack. When I saw this box, I knew it would make a great looking CBG, and I'm really pleased with the finished item. 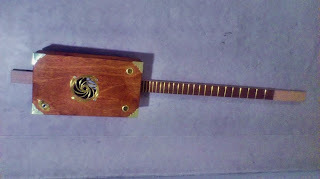 - Brass key bridge, 24 brass frets, White Oak neck, Mahogany Fretboard. Piezo transducer pick-up. - ON SALE NOW ! - Leave a comment, or contact via Facebook. Pretty looking and sounding great. Electro acoustic 4 string, mahogany neck and fingerboard. 24 brass fretd, abalone marker dots, piezo transducer pickup. Tenor, Electro-acoustic Canjo, using a Coca Cola Can as a resonator. Key bridge, brass nut, 2 brass tuners, 2 chrome, piezo pick up, mono jack. Completed today, This CBG is made from a Montecristo Box, with an American white oak neck, mahogany fingerboard, white marker dots, 24 steel frets, 4 chrome tuners, bone nut, brass bolt lock bridge and 11 brass sound hole grommets. It is tuned GDgB using the middle 4 strings from a Martin acoustic Set. I've fitted a piezo transducer pick up and a standard, mono jack socket. Here's a video of me trying it out. Apologies for the singing and playing! Leave me a message, here or on the facebook page, or e-mail mrjonthehat@yahoo.com before March 21st 2013. CHEERS !